Greatly improved wet adhesion by a specially developed tread pattern with a significantly increased drainage effect. Due to the newly developed silica compound we were able to increase grip, driving pleasure and the feeling of safety in wet conditions significantly. The newly developed "grip limit feedback technology" enhances safety in an inclined position because the driver is given early feedback from the tires in the border area and thus can retain control over the driving situation. 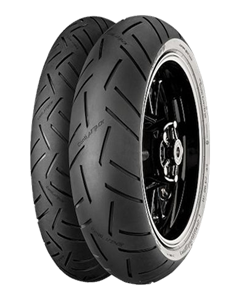 Specially adapted to the new sport bikes tire construction for a perceptibly more stable and precise handling. A further significant improved adhesion by an enlarged contact surface and a technically optimized tread design. Higher mileage by a larger contact area at the zenith of the tire and a high positive profile portion in the middle band and the re-optimized Multi Grip technology.